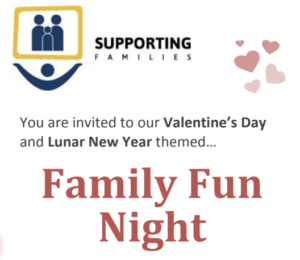 Title Family Fun Night – Valentine’s Day & Lunar New Year! Description You and your family are invited to our first Family Fun Night of the year! Our theme this time will be a mix of Valentine’s Day and Lunar New Year, so come out and meet your community and enjoy a night of games (with prizes! ), crafts, and delicious Chinese food (with desserts).